The show boat Cotton Blossom pulls into another port, ready for another weekend engagement. This port, however, has Gaylord Ravenal, a professional gambler who lost his boat ticket in a bet and needs a ride to another port. 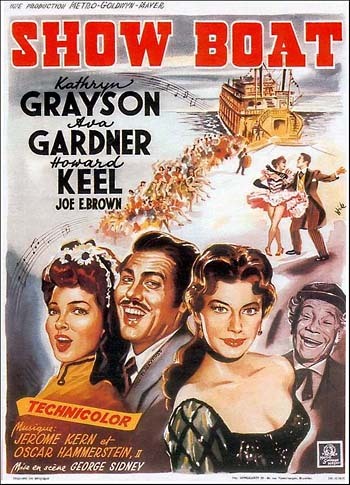 On the boat he meets Magnolia, the captain’s daughter who dreams of being a performer. He more or less falls in love with her almost immediately, but she’s not so sure of him. However, since the boat’s acting pair have to leave the cast due to racism, Gaylord gets passage as their new leading man opposite Magnolia, and from working so closely together and defying Magnolia’s censorious mother, they really do fall in love right on stage. They leave the boat to get married, and for a while live high on a lucky streak. Gay’s streak eventually fades, and they lose almost everything. Eventually, Gay decides that the only fair thing to do is to run out on Magnolia, leaving her a bit of money for travel, but what he doesn’t know is that she’s pregnant. I think I was thinking of an earlier film version when I mentioned the incredibly deep singing on Old Man River. This show just keeps going rolling along. I did some (too much) reading about the different versions and learned that in this one, the producer aggressively cut pretty much everything that wasn’t relevant to the plot. A producer after my own heart, and I still felt some numbers ran on too long. I’m also disappointed that the dancing couple got all their comedy cut, leaving them just an irrelevant bit of spectacle for people who like watching dance instead of a silly pair of bumblers that could appeal to anybody. This is an unusually dark musical, especially for the time. Sure, there are happy, bright musical numbers, but the story deals with racism, abandonment, and single parenthood. When it was written, even having white people and black people on the same stage was scandalous. It’s actually a very interesting twist on the musical format to have a man leaving his wife because he wants better for her than he can give her. Comic actor Joe E. Brown actually gets a surprisingly (and satisfyingly) large role. I usually just see him in cameos, but as the boat captain and Magnolia’s father, he actually gets rather a lot to do, even if he’s not strictly important to the plot. He even gets to be a New Year’s drunk. Watch this movie: for the classic songs, and some substance in musical storytelling. Don’t watch this movie: for strict faithfulness to the source.